Advances in computation abilities through less expensive, more efficient processors, plus the generation of big data, has more people trying to figure out how to conduct sophisticated, large-scale analyses that can have applications in science, engineering and social sciences. But there are limits on how small and powerful processors can be before the work they do has to be shared out among parallel processors, or in cloud computing. That makes optimizing complicated sequences of nested mathematical functions — layers of functions within functions — even more challenging. Carreira-Perpiñán has devised an algorithm that intersects applied math, statistics and computer science. It considers each of a mathematical function’s layers on its own, but also coordinates all the functions so they work together to get the desired outcome, whether it’s recognizing objects, recognizing speech and faces, helping self-driving cars, predicting the properties of materials or forecasting the stock market. For example, the algorithm makes it possible for a computer to look at a picture you’ve taken of Yosemite National Park and, by computing progressively more abstract features such as edges, corners or object parts layer by layer, categorize the objects in the image such as mountains, trees or people — information your brain would come up with before you’ve even had time to snap that picture. This is the second Google award given to a UC Merced faculty member, and Carreira-Perpiñán’s work is directly related to the many complex functions being performed at the company every day. 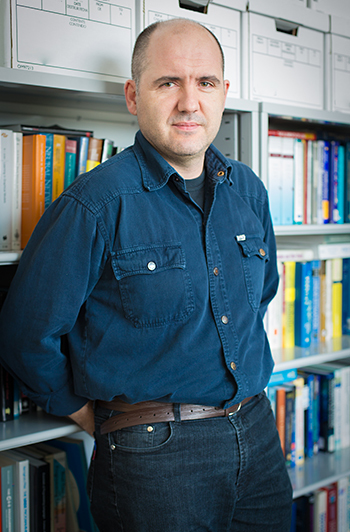 Carreira-Perpiñán’s work also earned him a Notable Paper award at the 2014 International Conference on Artificial Intelligence and Statistics, one of the leading conferences in machine learning. He wrote the paper “Distributed Optimization of Deeply Nested Systems” with then-Ph.D. student Weiran Wang, who’s now a postdoctoral scholar at the Toyota Technological Institute at Chicago. The $60,000 from Google — one of 105 awards given out of 550 applicants from all over the world — and the $450,000 from NSF will help Carreira-Perpiñán and his four current and past Ph.D. students (Mehdi Alizadeh, Ramin Raziperchikolaei, Max Vladymyrov and Wang) continue with their work on the algorithm. The work is directly related to artificial intelligence, which has seen interest surge again as developments like this offer significant advancements.